For many, the Everest Base Camp Trek is the experience of a lifetime. As with any trek in a foreign country, food plays a big role in learning the culture of the region as well as nourishing you for the long days spent trekking through the hilly, barren terrain. Luckily for those on the Everest Base Camp Trek and its variants, food is readily available at the many tea houses dotted along the trails – small hotel-like dwellings that provide trekkers with a bed and a hot meal for the night. Our detailed article on tea houses will tell you all you need to know about them. You might think that because you don’t have to worry about preparing food on the trek, there’s nothing more to know? Not quite. The remoteness of the Everest region and the cultural traditions of the Buddhist Sherpas mean that eating breakfast, lunch and dinner is no longer the simple affair it may be back home. There are considerations that must be taken into account, all of which will be detailed in this article in an FAQ approach. What type of food is served in the tea houses? Because the region is remote and all food has to be walked up to the various villages, most meals tend to be made up of non-perishable ingredients – cereals, rice and grains will form the staple of most dishes. The most common side to go along with the staple cereal is a cooked lentil soup called Dal. Along with steamed rice, this forms Nepal’s most famous dish – one sure to be found at all tea houses – Dal bhat. Other dishes on the menu tend to be re-arrangements of dal bhat with a different staple side, or a soup made from different vegetables. You’ll soon see that range of food on offer is very limited! You will find meat on the menus of most tea houses, although as a rule of thumb we recommend staying away from meat products, especially at higher altitudes. Because all the meat has to be carried, by foot or by yak, up from the lower reaches of the mountain to the villages, the freshness cannot be guaranteed. There are animals which live on the mountain, such as yak – a common steak dish – but the religion of the locals prohibits the slaughtering of animals in the area. 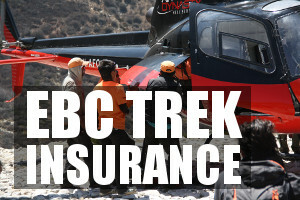 All meat is flown into Lukla, then walked up the mountain, adding to the risk of meat that is not fresh. How fresh is the food in general? The freshness of all food in the Everest region will never be great because of how remote it is and how limited access to the region is. A common complaint among trekkers is that the food was not as fresh as they would have liked, but this is largely unavoidable and is part and parcel of trekking in the Himalayas. One way to try and ensure you are getting fresh food is to stay at tea houses that are popular or that look busy and crowded. They will usually accommodate the most people and so will get food delivered to their doors more frequently. Will there be fish, eggs and fruit? Seafood is very uncommon on the trek and it’s not hard to see why! If you’re lucky, your tea house will provide the option of a cooked breakfast with eggs and hash browns, but this can’t be guaranteed. Porridge, cereal and toast are more reliable members of the breakfast menu. Fruit does not grow at such extreme altitudes so you won’t find much in the fresh fruit bowl. More common are vegetables, with the majority of dishes in the tea houses actually being vegetarian. That being said, the variety of vegetables is not world class – lentils and green veggies like spinach are common. Will I get 3 meals a day? Yes! For the majority of the trek, you will get three sit-down meals in tea houses with only the remote parts of the trek requiring you to skip the odd lunch. As said before, breakfast involves porridge, tea and possibly some egg to get you ready for your day’s trekking. Breakfast is usually eaten at around 8am, so get ready for some early starts! For lunch you will stop at one of the tea houses you pass during your day of trekking. 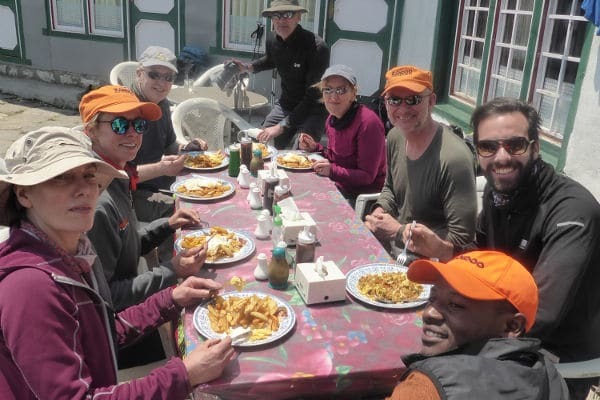 The lunch menu will closely resemble the dinner menu (if not exactly the same), so you can expect the familiar rice and lentil dishes such as Dal bhat as well as the popular garlic soup – thought to prevent the onset of altitude sickness. Dinner is typically a communal affair in the Himalayas, so you will join many trekkers as you sit down around a large stove and chat about the day’s affairs. The usual meals will be on offer, as well as some tea and even beer to wash it all down. 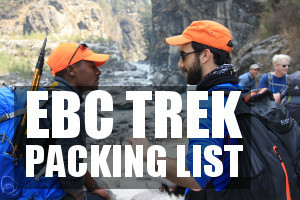 What can I drink while on the trek? If you’re trekking with a tour operator, they will provide filtered water for the duration of the trek, however, bottled water can be purchased at most tea houses and other small shops along the route. The tea houses themselves will fetch water from the local stream, which is boiled and then used to make tea, coffee and for cooking purposes. If you’re not comfortable with drinking boiled water from the streams, bring some water purification tablets with you. Drinking tap water without boiling it is not recommended, especially for foreigners to Nepal. Staying hydrated at altitude is very important so we recommend drinking between 3 and 4 litres of water per day. This can be in the form of bottled water, tea and soup. Remember to bring your own tea bags, as tea houses will only provide 1 bag per tea pot – a travesty if I’m honest! This staple dish is what gets most travellers through their 2-3 weeks in the mountains! It is made up of a generous helping of steamed rice served alongside a lentil soup that contains spinach, chilli, garlic and ginger. It’s got a strong flavour but is very nourishing and will provide you with some much-needed energy. Despite recommending that you stay away from meat, yak steaks can be very tasty and safe if fresh. If you check with your guide, they will be able to confirm the freshness of the meat. The steak is usually served with some cheesy sauce to give your body some essential protein! The popular dish is exactly what its name suggests – a soup made from garlic! This deceitfully tasty dish is thought to prevent the onset of altitude sickness and so is very popular mong trekkers and locals alike. Almost a cross between a roti, naan and a pizza base, Nepalese bread is cooked in the local tea houses and is the perfect complement to most dishes. It’s also great to snack on while trekking so leave some space in your backpack. In recent years, Asian (and specifically Chinese) cuisine has become increasingly popular in the tea houses. Chow mein and momo, a form of dumpling, are regulars on the menu and offer a welcoming break from the monotonous Dal Bhat after a few day’s trekking! The food can get a little bit repetitive but that is a small price to pay to spend 2 weeks in one of the most beautiful parts of this earth. Enjoy trekking! Hi Ernie, it’s not the best idea to drink alcohol when trekking at high altitude. Most teahouses sell alcohol so availability is not a problem. I recommend avoiding alcohol once you get above 3,000m. All the best! What about bringing your own beef jerky, dried fruit, and protein bars? Definitely a good idea to bring snacks like dried fruit, beef jerky etc.